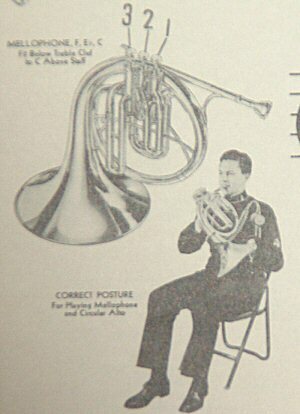 The mellophone is not a French horn (more properly called the Horn, or waldhorn, as it is not a French instrument), and it is therefore not held like the French horn. Where the French horn is concerned, the instrument is acoustically designed to have the hand placed inside the bell, where, by means of skilful manipulation, one is able to produce a complete chromatic scale without employing the valves. Prior to 1818 and the placement of rotary keys on this instrument, this is how the French horn (the valveless instrument now referred to as the “natural” horn) was played. But in the case of the mellophone, placing one’s hand in the bell does not work with the instrument’s acoustics in producing a full and resonating sound. Instead, the hand acts as a muffler, impairing the tone and intonation of the instrument, the same as it would with a trumpet, trombone, or any other brasswind with the sole exception being the French horn. That said, it is possible to teach oneself to use the hand to color the tone somewhat, as long as one remembers that the presence of one’s hand in the bell is not having the same effect as placing one’s hand in the bell of a French horn. In simple terms, you can’t hand-stop a mellophone, but you can hand-mute it. (A) Place the thumb of your right hand against the underside of the lead-pipe, and between the first and second valves, as you would with a trumpet or cornet. (B) Place the rim of the bell against the crotch between your left thumb and first finger. In hefting the instrument, you’ll notice that the weight is actually supported along the length of the first finger. (C) An alternate method, demonstrated here by our friend Don Elliott, who, as you can see, is holding the horn by the 3rd valve slide. This is altogether not a bad practice, as it balances the horn better, thus giving the right hand more freedom for faster passages by putting practically no strain on it. This practice moved laterally to the Conn and Reynolds Mellophonium. (A) Place the thumb of your right hand against the underside of the lead-pipe, and between the first and second valves, as your would a trumpet or cornet. DO NOT EVER PLACE THE LITTLE FINGER IN THE PINKY-RING!!! The placing of the little finger in the pinky-ring (or loop) greatly impairs the movement of your third finger, and can lead to repetitive-stress damage and tendon damage. (B) Hold the valve-casing between the thumb of your left hand and the first two fingers. If there is a slide-adjustment for the third valve, the third finger goes in its ring. If not, use it as you would the first three fingers. If your instrument has a short-length valve-casing, place your little finger underneath the third-valve tubing to support your instrument’s weight. (C) Place your fingertips on the tops of the valve buttons, and shape your hand as though you were holding a ball. You will need this stance in order to achieve maximum performance. (D) The aforementioned exceptions include the Conn and Reynolds Mellophonium. 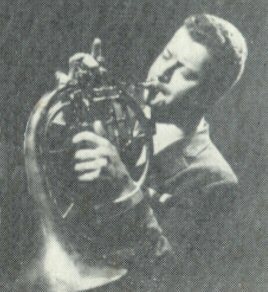 The right hand remains the same, but instead of holding the valve casing with the left hand, you'd grip the third valve slide (see the photo of Don Elliott above).